I recently posted a picture on Instagram that showed a close-up of the 4th grade multiplication worksheet my son Jack was working on. I think my caption said something like, “Math homework: Don’t ask me for help, kid.” And apparently I wasn’t alone in my sentiment of being mystified by grade school math because other moms immediately left comments on the picture agreeing with me. Or saying something like, “That’s why I’m glad I married my husband, so he can help with fractions!” Oof. Per Jack’s 4th grade teacher’s advice, I tried this one out and had limited success at first. (“What? I don’t know how to do it! That’s why I’m asking you!”) But with a little patience, and me easily playing dumb, Jack warmed up to the idea of him telling me how to do the math problems. Saying the lesson out loud helps a lot of kids understand it better and it made me understand it, too. Kids are given math homework to reinforce what they learned during class. Therefore, teach them to go over the worksheet or textbook examples a couple of times before diving in to the problems. It may seem like an obvious step, but most kids don’t take that extra minute or two to understand what they’re doing before they starting the first question. My boys are only two years apart, so fortunately Sam still remembers everything that Jack is doing in class. Of course, Sam sometimes just tells him the answers because he wants to go play videogames, but most times he’s good at explaining to Jack what needs to be done. As far as helping Sam, the oldest, with his homework, we’ve called friends with older kids and/or asked our high-school babysitters for help when desperately needed. It might be embarrassing to ask a grade school teacher for a math refresher, but I know a few parents who’ve visited their kids’ teachers during office hours and asked them to explain certain lessons. Teachers realize some of us learned things differently than kids do now and are almost always happy to help. I’ve also had a few friends highly recommend the book “How To Help Your Kids With Math” because it explains math with quick, simple visuals. A lot of teachers require this on homework, much to Sam’s dismay, but even if it’s not required, it’s still a good idea to have your child do it. That way, if they don’t get the right answer, you can both look over what they’ve done and see where they’ve gone wrong in finding the solution. Yes, it takes longer, but it can help make things easier in the long run. Finally, last week a friend mentioned that her daughter’s middle school math teacher was trying out something called a “Flipped Classroom” in which kids don’t have a traditional classroom lesson, then take-home homework. Rather, they watch the teacher give a lesson at home via YouTube, then do the hands-on work the next day in the classroom under the teacher’s supervision. I absolutely love this idea and hope more teachers consider trying it out. As for me, my efforts to be more patient and open to learning have made me slightly better at 4th grade math. But more important, they’ve cut down on a lot of frustration for all of us. But I still have no clue what time the first train arrived. 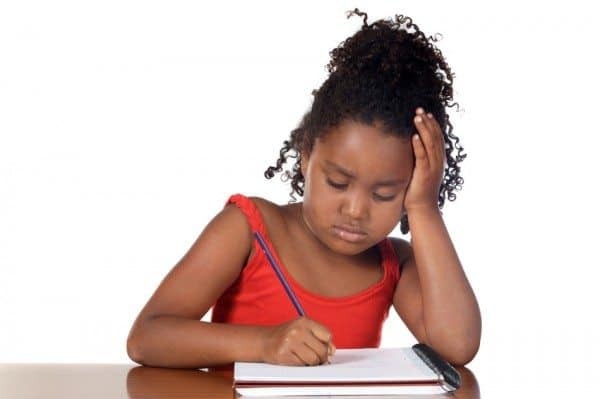 What tips or tricks do you use to help your child with math homework? Before I became a SAHM I taught high school math. Since having kids I now tutor middle and high school students at night. I LOVE math and really miss teaching. Most of the parents probably could help their kids, but they just don’t want to. I have noticed kids tend to get less emotional and frustrated if an outside party is helping them. I loved Math. Loved it cause it had rules and was predicable. Granted I had to figure out said rules (looking at you calculus) but it was predicable. Like grammar and punctuation drills. The American English language has very specific rules. Learn them, and good ACT scores are your reward.